October is almost ending and Halloween is just around the corner. It’s the time of the year when we are planning of dressing up on what character we would like to represent on the day of the dead. If you will ask me what I would like to dress up for this year, I would rather be a fairy, a goddess, a white lady, or anyone that requires to wear a light and flowy dress. My mind just wanted to rock that fashion statement on November 1st. 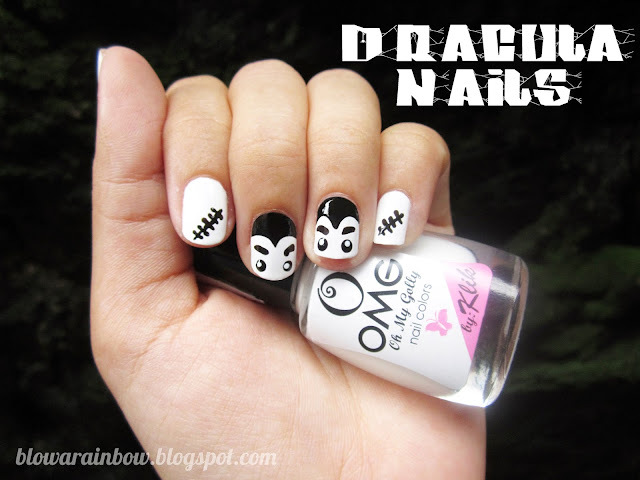 On to this blog post, since it is Manicure Monday, I am sharing my first Halloween-inspired manicure for 2013! 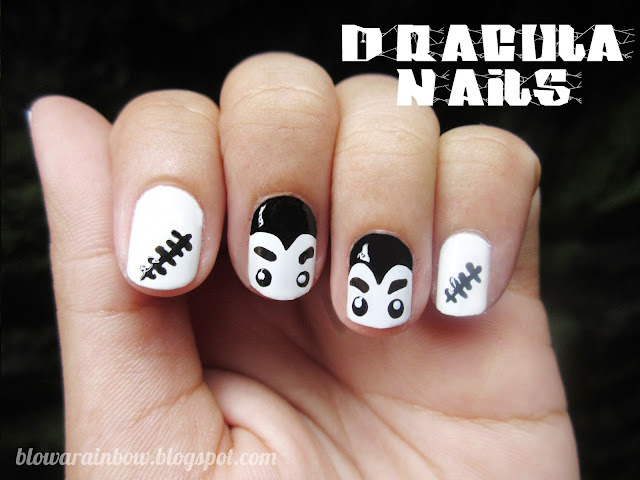 I’m quite proud on how these Dracula nails have turned out, not scary but cute! Plus, it was super easy to do and you will just need 2 basic nail polish color, which is black and white. You will also need a dotting tool or a toothpick to draw Dracula’s face and those stitches. I recommend this manicure if you are looking for a last minute idea since it is so easy to recreate. I decided to have his face as accent nails on my ring and middle finger, and decorate the rest with stitches. 2. Draw 2 curve lines that meets at the center and fill it in with either a dotting tool or a toothpick. 3. Draw 2 medium circles for eyes. 4. Draw 2 lines above the eyes for eyebrows. 5. Draw 2 smaller circles inside the eyes for details. 6. Finally, add a top coat to seal in your design. For the stitch, simply draw a straight line and add smaller lines perpendicular to it. Also add a top coat to seal in your design. That is too cute! I love it! OMG!! They look so funny and cute!! Disclaimer: All the photos posted in this blog are not mine. It was all from the internet. Picture Window theme. Powered by Blogger.